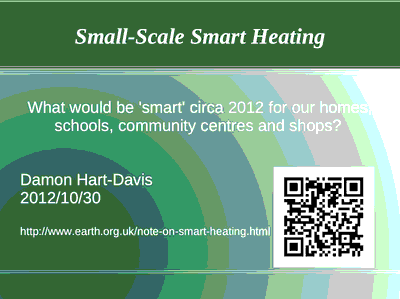 What would be 'smart' heating circa 2012 for our homes, schools, community centres and shops? Asked to summarise at a Department of Energy and Climate Change workshop 2012/10/30 how we could make heating smarter in the UK and reduce its carbon emissions, this presentation briefly surveys what tech was then available and what could be done better, especially in the home. This lead to OpenTRV development, and to Radbot. Some background information on what really good heating controls are out there. And what research has been done to determine actual performance. Sketches of some better/smarter heating controls that might be piloted. This is informed from trying to make my own modest ex-council house more efficient. It's now a "SuperHome". Also from working on energy consumption from the school at which I am governor. Also interesting knotty problems for which help was sought on Internet fora. These are all cases where there are unlikely to be dedicated facilities management staff being hounded by a CFO and the Corporate Responsibilty supremo, nor direct contracts for balancing services with National Grid. So relatively simple robust systems are the order of the day. There is a host of potential reasons to smarten our heating systems. From strategic national level to personal tactics for warm toes and fingers. Not all components will support all of these. But like the best distributed algorithms can pull in the same general direction. Reduction in peak demand and other load shaping? Better use of local and distant renewables? Avoiding need to heat/cool at all, eg MHRV and Passivhaus, shut doors! Avoidance also includes behaviour changes and user education. From keeping a house cooler and wearing more layers in cold weather, to keeping shop doors closed as NYC has insisted on for many years. There is still significant heating with no thermostats (or only safety stats), such as open fires and cranky old central heating systems that are on or off. They rely on subjective and annoying manual intervention for operation. The next step up is thermostatic control of individual heating devices. Think forced convection fan heaters and oil-filled electric radiators. Beyond that is a single master thermostat for a building, eg a house or school, with possible unbalanced heating though a large/complex space, though often still with more efficient (in exergy terms) heating sources. Adding back some local control with radiator TRVs, zoned or per-room thermostats, and even occupancy-driven multi-level setback temperatures, can increase heating efficiency and local comfort too. All these are available off-the-shelf at domestic scale upwards. Weather compensation (running the heating harder when outside is cold) is somewhere between thermostat and anticipation in sophistication. Some of the most effective basic savings are from turning heating off/down when people are expected to be absent or asleep. That is, time controls, often on daily or weekly cycles. They may prove less useful for people on shifts, and often require at least seasonal adjustment. Not to mention occasional manual overrides for holidays, late meetings, etc. Some time-programme functionality could be replaced or enhanced by occupancy sensing. Plust some fast (eg radiant) heat for when people are unexpectedly up and about. The boost button is a simple concept and widely depolyed such as an "I feel cold button" for force the heating on/up for half an hour. Or an "I've got guests" button to boost DHW heating for an hour or a tankful. Predicting when heat will be needed allows slower-reponse systems such as UFH or radiatiors running at lower temperatures to be used. These in turn are potentially more efficient in 'exergy' terms, eg heat-pumps can be run with a higher CoP to deliver the same heating comfort. Clearly, in all sorts of other ways predicting the future can be valuable. Remote control of heating is potentially useful for irregularly-occupied spaces. Thus averting the real horror of people leaving heating/air-con on for an entire holiday so that the first hour back will be more comfortable. In this case the human is doing the anticipation explicitly, but easily, from their mobile phone while en route home maybe. It would be good to find a away to help people tune their heating performance against HDD (Heating Degree Days) in-home and without feeling like an engineering test. Such sites as iMeasure already provide the tools. Storage of heating energy in the home, from concrete thermally massive interiors to the DHW hot water tank to possible battery packs upstream of a heat-pump, can all potentially load-shape demands on the grid, make better use of local and remote intermittent sources, reduce end-user cost and increase comfort. There are pros and cons: a thermally-massive interior keeps temperatures stable and potentially allows use of very efficient high-CoP heat-pumps for example. But such structures need a lot of anticipation unless run continuously, which may be inefficient. My thermally-lightweight house can be warm in half an hour from chilly if need be. And our bedrooms need only be warmed shortly before occupation . A DHW tank incurs storage losses that may be significant (would be ~25% of consumption for us) but is an enabler for solar thermal and heat pump. In my house, on top of more aerogel drylining and MHRV, I'd take the smart wireless TRVs and occupancy sensors. Why? So that rooms that people are in (and stay in for at least a few minutes) are warmed. We'd dispense with a single thermostat for the house. A simple upgrade with LightwaveRF's TRVs (but no occupancy sensing) might be £180 total to get two soft zones. (£60 for boiler control to replace existing building thermostat then £60 for each room for TRV + thermostat at £30 each. Plus optional magnetic door/window catches at ~£25 each to avoid calling for heat with windows open.) Normal TRVs would be left on other rads to continue to scavenge heat as now. The school likewise could do with software zoning and (child-)tamper-proof TRVs and possibly CO2-driven MHRV to avoid air getting stale and windows opened even in the depths of winter. If those TRVs shut down when windows opened, even better. Door closers on all exterior doors are on the list to do, too. Less-regular parts of usage patterns add difficulty and complexity. Think of a shift-worker, half-term holidays at school, and paper-based irregular bookings for a hard-to-heat community centre. In all cases, before and after monitoring of HDD-normalised heating efficiency, bills, and satisfaction 'soft' feedback reports would be a minimum. Didn't find: drop-in friendly replacement for normal/setback/frost PIR+timer 2-wire thermostat! Close The Door of shops (up to 50% energy savings claimed, enforced for large NYC stores) etc, but maintain ventilation with MHRV if necessary! PassivSystems claims energy savings of 20--40%, cf typical 2%--15% claimed for IHDs and smart metering alone. 2003: A Levinson et al, Georgetown University US and NBER: "In brief, we find that tenants living in utility-included apartments set their thermostats between one and three degrees (F) warmer during winter months when they are absent from the premises, all else equal." Also NYC apartment energy consumption said to be ~30% lower where utilities not included in rent. 2012/10/19: Honeywell's UK 'Smart Energy' Trial Cuts Peak Power Use by up to 36%. 2013/02/14: the Making dumb European rollouts SMART — Three golden rules of consumer engagement. 2013/02/11: the CEA-2045 modular communications interface (MCI). 2012/10/18: myHome remote central heating control app review: British Gas's app for iOS and Android lets you turn your boiler on remotely - and could save you money on heating bills. 2012/10/12: LightwaveRF home automation: iPhone-friendly smart control for central heating joins the network: "The Thermostatic Radiator Valve enables you to turn each radiator or group of radiators into an independent zone that can be controlled via a timer, or remotely via your smartphone or PC. There's also a boiler switch to turn your heating on and off remotely, a radio thermostat to monitor your home and trigger the heating controllers, and the thermostatic radiator valves can be switched on or off via LightwaveRF's magnetic window switches and PIR motion sensors." 2012/10/12: Dimplex Quantum 'smart-grid'-friendly electric storage heaters in Shetland, partly to soak up wind turbine output that would otherwise be 'constrained off' by transmission limitations. DECC March 2012: The Future of Heating: A strategic framework for low carbon heat in the UK. 2012/03/07: Bloomberg New Energy Finance: Is home energy management taking off across Europe? : "In the UK and Netherlands, competition and customer service are the key drivers and energy companies are already commercialising certain HEM applications. The UK has plenty of in- home displays (IHDs) already in the market, with some 2m sold, while smart heating controls are gaining momentum." 2009: JM Pearce: Expanding photovoltaic penetration with residential distributed generation from hybrid solar photovoltaic and combined heat and power systems: "The results show that a PV + CHP hybrid system not only has the potential to radically reduce energy waste in the status quo electrical and heatingsystems, but it also enables the share of solar PV to be expanded by about a factor of five." 2009: José R Villar et al: A fuzzy logic based efficient energy saving approach for domestic heating systems. 2009: Michelle Shipworth et al: Central heating thermostat settings and timing: building demographics: "Contrary to assumptions, the use of controls did not reduce average maximum living room temperatures or the duration of operation. ... social marketing programmes could use the wide variation in thermostat settings as the foundation of a 'social norm' programme aimed at reducing temperatures in 'overheated' homes." 2009: A Molderink et al: Domestic energy management methodology for optimizing efficiency in Smart Grids: "Multiple optimization objectives can be used to improve the efficiency, from peak shaving and virtual power plant (VPP) to adapting to fluctuating generation of wind turbines. In this paper a generic management methodology is proposed applicable for most domestic technologies, scenarios and optimization objectives. Both local scale optimization objectives (a single house) and global scale optimization objectives (multiple houses) can be used. Simulations of different scenarios show that both local and global objectives can be reached." 2008: R Anderson et al, NREL: Maximizing Residential Energy Savings: Net Zero Energy Home Technology Pathways. 2008: V Bakker, Twente Univ: Domestic Heat Demand Prediction Using Neural Networks: "In this paper we present the results of using neural networks techniques to predict the heat demand of individual households." 2008: L Peeters et al: Control of heating systems in residential buildings: Current practice: "The results show that current practice does lead to important energy losses, resulting in overall efficiencies as low as 30%, but improvements are possible by using intelligent controllers. However, correct boiler sizing and a sound combination of boiler and heat emitter control are still required to ensure high heating system efficiencies, especially for better insulated buildings with a high heat balance ratio.". 2005: J Cockroft et al, University of Strathclyde: A comparative assessment of future heat and power sources for the UK domestic sector: "The main finding of the work is that air source heat pumps yield significantly more CO2 savings than any of the other technologies examined." 2003: A Levinson, Georgetown University US and NBER: "In brief, we find that tenants living in utility-included apartments set their thermostats between one and three degrees (F) warmer during winter months when they are absent from the premises, all else equal." Better heating controls for a multi-room community building? : "A clear problem is that the TRVs are the only mechanism to control heat to individual rooms, and reportedly they are nearly always turned up to maximum from October to May, regardless of occupancy and outside temperature. Windows are opened by occupants if too hot and can be left open - with rads blasting away - after the meeting / bridge session has finished." Various Prefect smarter heating controls at Dealec. PECO T170 all-dancing commercial thermostat with motion/occupancy sensor inputs. Heatmiser PRT - Programmable Thermostat. ICY Occupancy-sensing heating system manager (Dutch). RFXCOM home automation parts including X-10 / Home Easy / etc transceivers for a LAN. Demotica European home automation forum. DECC's Community Energy Online Portal. 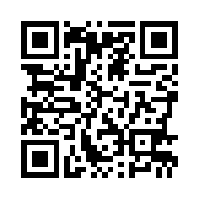 QR code for this page c/o qrstuff.com. First published 2012-10-26 , updated 2019-04-22 , rebuilt 2019-04-23 . Site copyright © 2007-2019 Damon Hart-Davis. Hosted by ExNet.